The partnership of Manuel Hernandez and Victoriano Aguado was one of the most successful in guitar making history. Please note that this guitar is currently for sale at Savage Classical Guitar. Please click here to see this guitar! I made this guitar several years ago, but because of custom orders, I had to set it aside. I put strings on it two weeks ago and it is a most magnificent sounding guitar! It has good, clear separation string to string, wonderful sustain with evenness and balance throughout with a very lyrical voice. I originally made this guitar for myself, but someone with a good strong technique and a good understanding of musical interpretation should own this guitar and play it on a regular basis. This guitar is a fairly close copy of a guitar made by Hernandez y Aguado in 1961. The body length is 480mm, most of the HyA guitars had a body length of 490mm; string length is 650mm, many were 655mm and longer; other than that I tried to stay as close to the original as possible. The headstock crown is a copy of HyA's work and if you look closely at the photo you can see that I recessed part of the face of the headstock and stippled it, like the original. 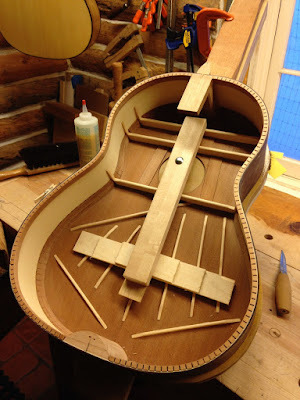 The sound board is braced with a typical HyA asymmetrical bracing with an angled cutoff brace towards the treble side. The soundboard is redwood that I re-sawed from a board that was salvaged from a barn that was located near Yosemite National Park. I estimate that the board I used was over 70 years old, the sound board is well aged and will continue to open up. The neck is Spanish cedar, it too is well aged, I was told the board it was sawn from was over forty years old. In the above photo you can see that the sides are laminated, the outside is East Indian rosewood and the inside is Alaska cedar. This is not something that HyA did on their guitars, I borrowed that idea from Jose Ramirez III. As I said, the back and sides are East Indian rosewood, along with ebony binding that has curly maple purling. Ebony fret board, 52mm at the nut and 62mm at the 12th fret; the bridge is East Indian rosewood with a mother-of-pearl tie block covering. Stop by the Guitar Foundation of America International Convention and Competition, June 20-25, 2016 in Denver, Colorado and visit me at my table in the Vendor Expo to play this wonderful guitar!